Face & neck treatment for wrinkles. Noticeable improvement to your skin requires changes at the cellular level. Skin Renu Wrinkle Reducing Formula is specially formulated to penetrate the skin, delivering natural oils to the innermost layer of the skin where ALL healing begins. Your skin will be softer and smoother to the touch. Continued use of Skin Renu Wrinkle Reducing Formula will combat the signs of ageing and restore the skin’s natural resiliency and elasticity. Your skin will become visibly healthier and more youthful. Good news! 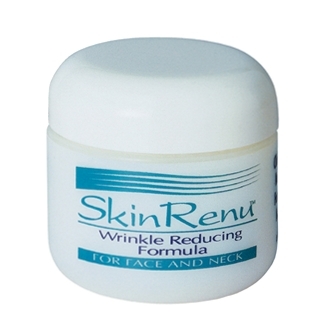 Skin Renu Wrinkle Reducing Formula helps keep skin normal. It’s formulated to penetrate the skin, delivering vital lipids and nutrients to the innermost dermal layer, where all healing begins. Cytokines (regulatory substances required for healing) are stimulated. Skin becomes rehydrated. Elasticity, shine and firmness are restored. It’s a proven system. Skin Renu Wrinkle Reducing Formula for Face and Neck is recommended for use on skin of any age. Use Skin Renu Wrinkle Reducing Formula on the face, neck, and around the eyes. Full wrinkle reduction benefit will require application of Skin Renu Wrinkle Reducing Formula for Face and Neck prior to other treatments. Normal sun care precautions should always be followed, though exposure to the sun will have no adverse effects. Skin cells take thirty days to regenerate. Continued, twice daily, use is required to fully effect the changes to your skin. After cleaning apply to face and neck. Use morning and evening for best results. May be applied under make-up. Do not apply directly to the eye. For external use only. Discontinue use if irritation occurs. Keep out of reach of children. Deionized Water, Iso Cetyl Stearate, Glycerine, Glyceryl Monostearate, Cholesterol, Squalane, Carrageenan Chordus Crispus Extract (and) Soluble Collagen (and) Ascorbic acid (Vitamin C) (and) Niacinamide (Vitamin B3), Laneth 16 (and) Oleth 16 (and) Ceteth 16 (and) Steareth 16, DNH Oil, Saccharomyces Sea Salt Ferment, Retinyl Palmitate (Vitamin A), Tocopherol Acetate (Vitamin E), Evening Primrose Oil, Carbomer, Triethanolamine, Allantoin, Phytosphingosine, Wheat Cermides (and) Wheat Lipids, Germaben IIE, Lemon Essential Oil.